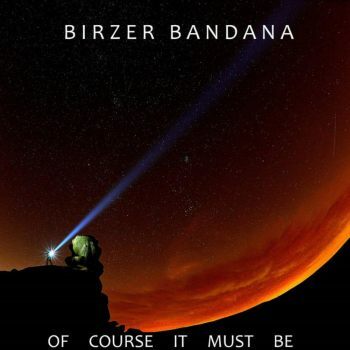 In 2017 Birzer Bandana released their debut album Becoming One (see review). For those who are not familiar with this outfit I have to introduce them one more time. Birzer stands for Bradley Birzer and Bandana stands for Dave Bandana. The first one has written the lyrics and concept and the second one is responsible for most of the instruments (bass, guitars, drums, drum programming, synths, piano, organ, mellotron) used on the album and did all of the vocals, besides that he wrote most of the music. Now one year later already a follow up can be welcomed by the duo. Titled Of Course It Must Be. Again, some guests can be heard. The most important off all is Olga Kent. She can once again, as on the debut be heard on the violin (1, 2, 3, 5, 7). For me she had a very important role on the album. Because her parts are very melodic and are a delight to hear and moves the album a bit towards folk music. They fit very well with the parts Dave himself played. Kenny Miller is another important guest on the album and helped them out on the acoustic guitar (1, 3, 5-7). While listening to their debut I found it difficult to compare the music of Birzer Bandana to other well known bands. I came up with names of acts such as Vangelis, Gandalf, Pink Floyd and Talk Talk. This time round only the influences of Pink Floyd come to the surface again. As for example can be heard on the opening piece Adrift. Maybe on this second release more space rock influences can be heard but it's certainly not a space rock album like Hawkwind or Gong has made in the past. It's certainly progressive rock you hear. Not so strange because Bandana did grow up in England listening to this kind of music. Therefore lots of melodic synthesizer solos can be enjoyed next to the wonderful Mellotron parts. As you can hear very well on the longest song on the album, titled The Void. The compositions are all of a very high level and not a weak track can be spotted. This time around, the lyrics are less focused upon theological issues and instead explore broader issues related to the human experience. Also the length of the album is perfect. With 53 minutes of music you never have the wish that after every track you want it to be the last one. Of Course It Must Be wasn't released on CD and is only available via different digital outputs such as Bandcamp, Deezer and Spotify. I can only say that it is certainly worth checking out this release. I enjoyed myself a lot while listening to this fine new release of Bradley Birzer. You probably will be as well. I am already looking forward to their next release. Without any doubt!